Happy New Year! And a happy, positive new-blog post to get the year started. For this post I wanted to focus on keeping active, and swimming – and this has been the one I have been most looking forward to writing! We were always an active family throughout my childhood, and DDH did not get in the way of that. However, walking has never been easy for me so swimming quickly took over. The hydrotherapy that followed my operations is my earliest memory of being in the water. From the dead/heavy weight of a cast, and then the seemingly even heavier weight of trying to get my legs to work again, water provided me some freedom and a chance to move without any restriction. It had both the physiological benefit of enabling me to learn to walk again, and, because I enjoyed it so much, a major psychological benefit. 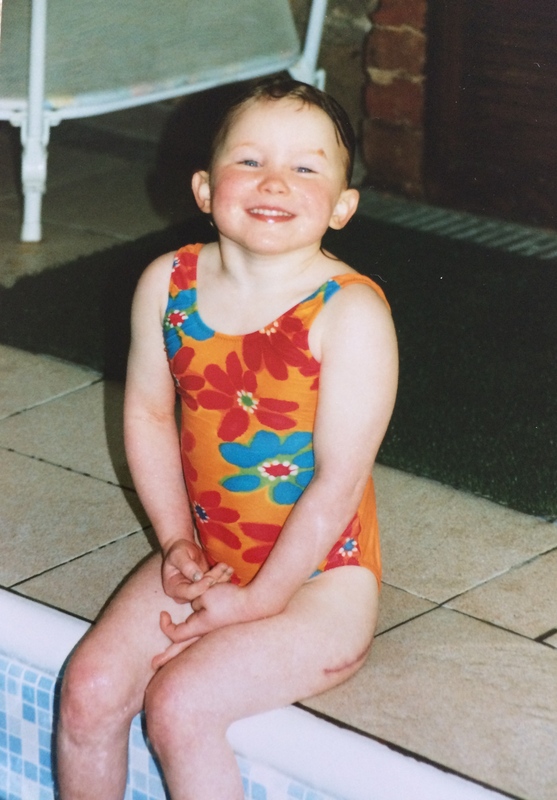 A photo of me sat on poolside a couple of months after coming out of plaster will always be one of my favourite photos and sums up everything – one of my bright red scars is very much there as a visible reminder, but it did not get in the way of a smiley younger-self because I was, quite literally, in my happy place. My love for swimming is one thing I am so grateful to DDH for, because it shaped the rest of my life and has been part of my happiest memories and experiences. I joined my local club shortly following my operations and made my way through the swim school and into the squads (quicker than I should have thanks to my first coach understanding that I would never do a breaststroke kick properly – and I still can’t!) I found that rather than DDH dragging me back, it actually put me ahead of my peers because I had developed a strong upper-body to compensate for my legs (which can quite clearly be seen in that picture of me age five!). My early competitions and medals, even at club level, and then becoming county champion aged 10 against ‘able-bodied’ (although I don’t like to use that term) competitors will be some of my proudest moments. Yet it did make it all the more harder to accept when I got overtaken at about age eleven by the rest of my peers who could use their legs properly. It was then that I was introduced to Paralympic sport and regained my confidence by competing with those of the same ability. I got to travel the world both for training camps and competitions with people who have grown to be some of my closest friends. During the last five years of my career I was training twenty-four hours of week both in the swimming pool and in the gym, and this hard work paid off with a number of medals, , and competing, at a home Paralympic games in 2012. However, such work did take its toll on what is essentially an arthritic condition. I retired in 2015 not quite having achieved all that I wanted, but happy that I had definitely proved wrong those who said as I child that I wouldn’t be able to do any type of sport. However, I do not want to just talk about my journey and what I wanted to stress through this blog-post is the key benefit that sport and keeping active has had on my physical condition. I have always been lucky at only four-foot eleven but I have also spent the majority of my life active and, especially in the last few years, devoted a considerable amount of time to doing physio and gym exercises to develop and build the right muscles to help stabilise my hip joints. Such work has resulted in a certain amount of leg strength and stability that I shouldn’t really have, and also a strong core, both of which has aided my general mobility a lot. Whilst I would perhaps not advocate the intensity of my previous training and would always advise getting medical opinion, I would encourage leading an active life with DDH to build muscles or strength (and my surgeon and those I consulted about my hips have always been very positive about my swimming career too). 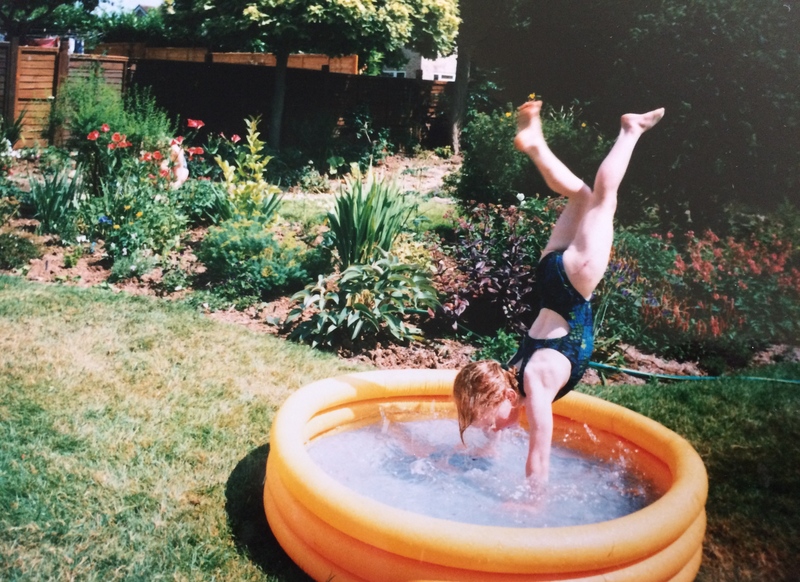 It is also the key thing I am most grateful to my parents for; it must have been difficult to not wrap me up in cotton wool but they really did the complete opposite and encouraged me to be active and get into sport – even if this did mean watching me flail about doing hand stands in a slippery paddling pool! Today, I still swim as regularly as I can and do a lot of low-level exercises on my lower body and HIIT workouts to maintain fitness and general strength but ensure that I do not over-do it. I also have found a bike to be another activity that has given me another sense of freedom. However, I know from experience that some activities won’t work out, and swimming will not suit everyone and I, for example, always came last on school sports day (and there was probably something a bit cruel about given the kid with an uneven gait the egg and spoon event!) BUT there will be something out there for you. I went into sport for enjoyment and a sense of achievement and all these things are possible, regardless of any international sporting career. My advice to all living, and growing up, with DDH is to always seek some form of medical advice, but don’t be afraid to try out different sports and activities. Why not make 2017 your year and do something you were told you couldn’t do or that you yourself didn’t think was possible. I will be joining you as I have entered the Great North Swim to raise money for DDHUK. 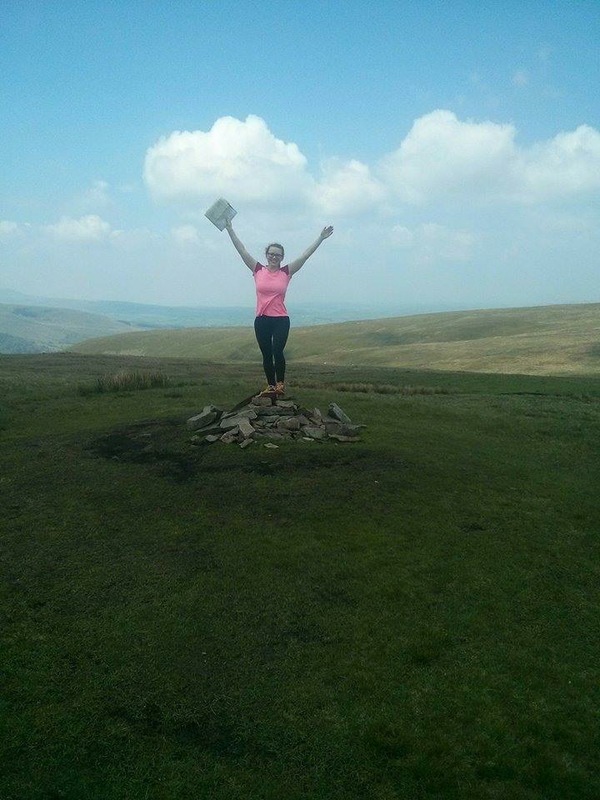 I am also not the first to set myself a target for 2017 as Gemma Barber, an active member on the forum, has set herself the challenge of walking the Wirral coastline in June. Don’t go too big at first and pick something that won’t over-do it and is achievable for you. I, for example, have chosen to do a swimming challenge because I know that I can swim the distance but the open water element is something brand new (and slightly scary!) Equally, this does not exclude anyone going through operations throughout this year, as you can set your own personal targets in relation to your recovery. Remember all achievements are relative, do not compare yourself to others, and never forget how far you have come. Yet, most importantly, don’t let any negative comments hold you back, believe in yourself, and don’t be afraid to chase your dreams. Happy New Year, and wishing you all a positive and happy 2017! I will be keeping you updated on my journey to the swim event in June and would love to hear from you too. Raise money for DDH UK – for free! Did you know that whenever you buy anything online – from your weekly shop to your annual holiday – you could be collecting free donations for DDH UK? Over 3,000 shops and sites are on board with easyfundraising and ready to make a donation. These including Amazon, John Lewis, Aviva, thetrainline and Sainsbury’s. Each one generates a donation and it doesn’t cost you a penny extra! 1. Head to https://www.easyfundraising.org.uk/causes/ddhuk/ and join for free. There are no catches or hidden charges and DDH UK will be really grateful for your donations and it will allow us to create posters and leaflets, buy more loan out books, work with more parents and more medics. It only takes a moment but believe me, it can change a life. 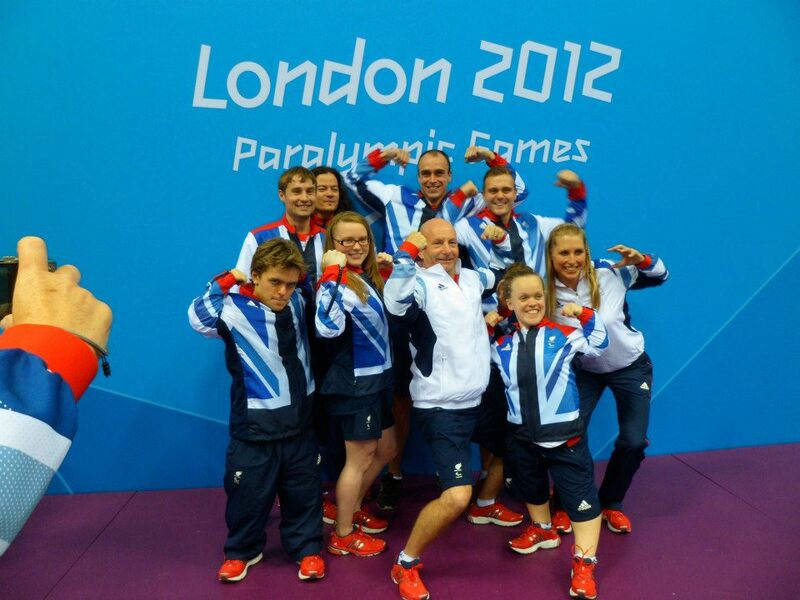 Gemma Almond is the DDH UK Patron and is today on the blog talking about hip dysplasia and pain, something she has encountered as a Paralympic swimmer. We think it is a brave, inspiring read and hope you do too. I thought I would start with the difficult topic, and I am not sure how best to approach it in a positive manner. Pain is something that is discussed extensively across the forum. I think DDH and pain come hand in hand. 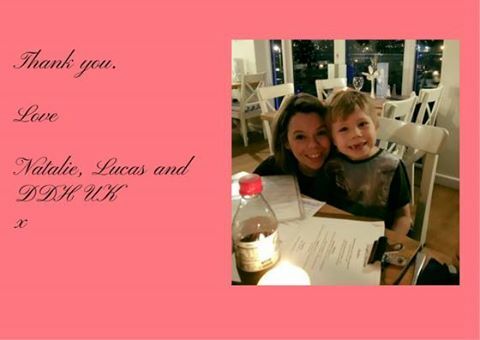 Although I cannot remember any pain I experienced in my childhood I know it was there – and it was recorded in one of my hospital appointments with my surgeon that ‘Gemma said she was fine, however, her mum stated that she often complained of pain’. Clearly, by the age of eight I no longer considered pain as being ‘not fine’ because for me pain had become normal. The pain I now experience can be separated into two key forms: a dull ache (I would say it is similar to an elastic band being tied really tight around your pelvis and upper legs) and the grinding or clicking bone on bone sharp pain. The latter is definitely worse than the former and is not so constant. But (and this is a big but!) over the years, I have learnt the importance of paying attention to pain levels and, more importantly, that it can be managed. I adopt a simple philosophy: when my legs are bad I do less, and when they are good I do more. This can be frustrating as unfortunately you cannot completely control this and, therefore, it is possible that you may have planned to spend a significant amount of time on your feet on a day that turns out to be a bad one. However, most of the time it works and I have tracked and recorded pain levels – I know, for example, I usually experience a couple of weeks of feeling better and then I’m likely to have a particularly bad week. Monitoring my pain also helped me to learn what sort of activities aggravated my joints such as standing for long periods having a more adverse long-term effect than walking. I also learnt how to reduce the effects of certain activities, such as using a stick to reduce shock and weight if I needed to walk any distance. The key thing I learnt to remember was that pain would often occur and peak the next day or the one after that, rather than the day of, and I learnt to brace myself for a particularly bad patch if I experienced pain at the actual time! However, realising this also helped me ensure that I never did anything too strenuous two days in a row. Ultimately, monitoring and understanding what aggravates my joints has meant that I have been able to make the most of my good days and do things I didn’t think possible, such as climbing the below mountain this summer, and below is the picture to prove it! How to overcome or reduce pain is heavily discussed across the forum, and it is completely individual which is why monitoring becomes so important. If it is really bad I might consider ibuprofen but that is about as strong as I am prepared to go, primarily because I prefer to know, and not mask, it. Also, if I know I am going to have a day on my feet I sometimes anticipate the effect it could have and take ibuprofen to help reduce inflammation from the start but they are probably the only two scenarios in which I use it. Otherwise I prefer to apply heat, such as a wheat bag, have a lot of baths to soak my joints, and swim to try to help loosen everything off. Pain can be a hard and lonely experience, especially when it prevents you from sleeping at night, and I think that is one of the many benefits of this group. I don’t think we can truly fight pain, but we can support each other and learn to manage it and lead a good quality of life. Most importantly I try to remember that I cannot remember the pain I experienced ten years ago, and I know that things can and will get better so it will, again, one day become another distant memory. If I can answer any questions, get in touch with DDH UK and I will be happy to help.